LOOKIN’ FLY. Visitors check out a previous ArtFly gallery pop-up in Eau Claire. The location of ArtFly’s next exhibit will be a secret until the day of the show. 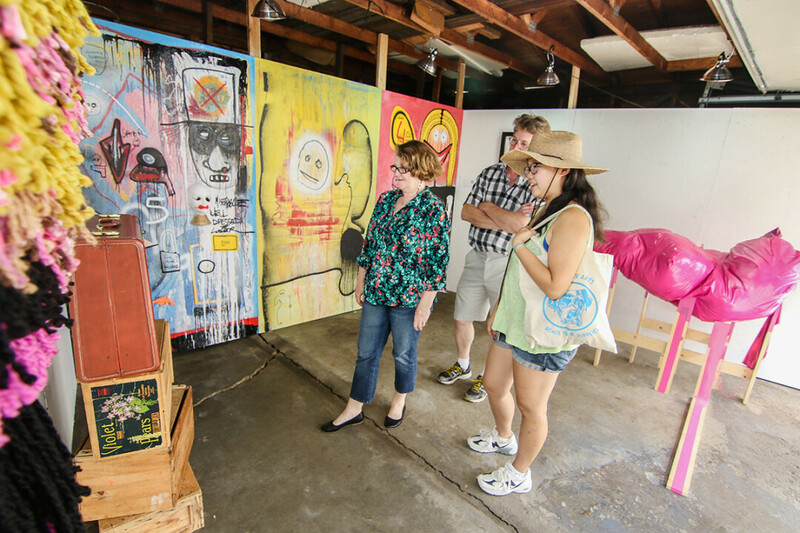 ArtFly, a contemporary pop-up art gallery that turns conventional spaces – such as a garage, a basement, or a local store – into a space to experience art for a single day or night is about to put on its biggest show to-date. Kelsey Wenberg, artist and genius behind ArtFly, is putting on “Touch Me, Baby: an interactive contemporary art exhibition” on Saturday, Feb. 24, from 5-9pm at a downtown Eau Claire location which will be announced only on the day of the show. ArtFly Gallery, which started in Madison and migrated to the Chippewa Valley, puts on pop-up art shows for a day or evening in different locations to let people experience art in an approachable way. “Sometimes walking into a museum or gallery can feel intimidating, and contemporary art in particular can seem impenetrable,” Wenberg said. “ArtFly provides a space for the public to experience art in a more casual way; we turn up the music, dress down, throw a little party where everyone is invited. It’s really about celebrating new art as a community.” ArtFly previously put on The Garage Sale Show and The Basement Show in Eau Claire last year. Wenberg says the upcoming “Touch Me, Baby” show will be even larger then previous shows and feature artwork from 12 different local and regional artists, including Gabriel Fischer, Scott Von Holzen, Ray Kaselau, Bailey Mastin, Cate Richards, Hope Greene, Katie Lawver, Jared Le Claire, Dan Green, Michael Peterson, Autumn Ash, and Scott Ellis. “This is not your typical gallery show though – we actually encourage the public to touch all of the art!” Wenberg said. Visitors can touch, hear, ride, wear, and influence the pieces on display. Wenberg says this is a great opportunity to teach kids about contemporary art in a fun way, and to break out those selfie-sticks. “I’m most excited to see several interactive pieces that will start out looking one way and end up looking entirely different by the end of the night, thanks to viewer participation,” Wenberg said. Another interesting aspect of this show is that in true pop-up fashion, the location will not be announced until the day of the show via email and social media. Those who are interested may sign up to receive an invitation by sending the message “ARTFLY” to artflygallery@gmail.com, or following @artflygallery on social media. Artfly’s unofficial mascot will parade down Barstow Street on the day of the show with flyers and other fun merchandise. Wenberg welcomes the community to become involved as Artfly pursues more projects. The organization is always looking for donations, volunteers, and new spaces to host exhibitions. Those who wish to support the program can send her an email at artflygallery@gmail.com. “I’d like to thank our current volunteers, participating artists, and a special thank you to our downtown collaborators who have made it possible for ‘Touch Me, Baby’ to be an unforgettable art event!” Wenberg said. To learn more, check out facebook.com/artflygallery.